In the early tradition of the Pāli Canon the Paccekabuddha (Sanskrit, Pratyekabuddha) refers to a male individual who has attained Enlightenment or insight (Bodhi; hence, Buddha) by himself. a Pratyekabuddha keeps Enlightenment for himself (pratyeka) and does not embark on a career of preaching it to others. During a Buddha Era, an Enlightened being like the historical Buddha (Siddhārtha Gautama) is born, attains Enlightenment, and eventually preaches the 4 Noble Truths that he has discovered. He then starts a dispensation on the basis of his compassion for other suffering beings. because, as the canonical texts explain, he lacks the compassion of a fully Enlightened Buddha. Even so, he is considered a Teacher, albeit a silent one, teaching by the example of his life and actions. 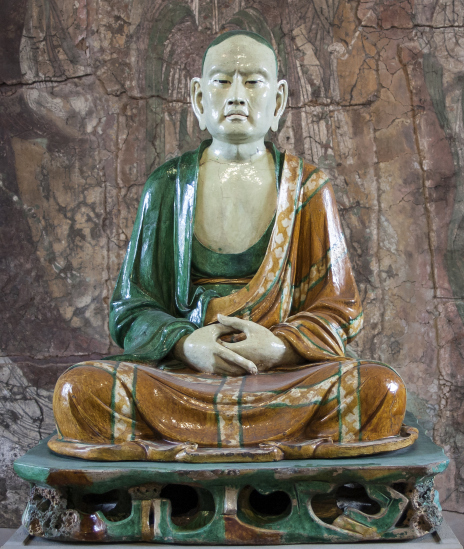 The figure of the Pratyekabuddha may have been the result of integration in early Buddhist history of pre-Buddhist ascetics, who had been revered by the people as Saints and Sages. By incorporating them into Buddhist history, early Buddhist communities were able to establish a kind of continuity with the pre-Buddhist period. At the same time, they were able to acknowledge the possibility of Enlightened persons in other eras and cultures. Pratyekabuddhas therefore have a special, but limited, place in Buddhist ideology. A fully Enlightened person, a Buddha, finds the Eternal Truths of the Buddhist message by himself and starts a period of Buddhism. A Pratyekabuddha, on the other hand, will not preach and will have no followers. However, according to Buddhist tradition, the Arhat did not reach this stage by his or her own efforts, but rather came to understood the 4 Noble Truths and travelled the Path as taught by the Buddhist tradition. but the path of a Buddha is believed to be the only worthy goal, the One Vehicle of Supreme Buddhahood, which will eventually be attained by all.